In want of other proofs, the thumb alone would convince me of the existence of a God. Palmistry is both an art and a science. It is based on scientific principles that can be learned by anyone. The hand is called ‘God’s Road Map,’ and is one of the most valuable tools we have for guidance. Knowledge of Palmistry will enrich the lives of all with whom you come in contact. The classes in Palmistry are unique, in-depth trainings. The School of Oracles is dedicated to preserving and perpetuating this sacred art in a manner that does honor to the wisdom, healing and illumination it brings to humanity. Everyone can benefit from this class. It is given for people who are curious to know themselves and others better and for those who would like to become a professional Palmist. 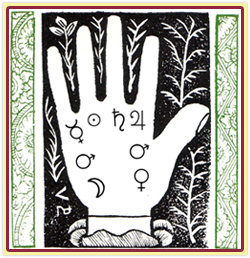 In class we will cover every aspect of the hand, the shapes, the lines, fingers, the seven planetary archetypes and so much more. We will have practice in reading hands and learn how to make a synthesis of the information we find. Palmistry’s use as a means of psychological insight and divination dates back thousands of years. Because the hand changes as you change, it is an up to the minute report from your own Higher Self. The hand shows how you are doing in many areas of your life, including health, financial security, your talents, strengths and weaknesses. It shows the best choices for a fulfilling life for the unique individual that is you. The hand is a mirror of the soul. In these challenging economic times, this class can be useful for those who would like to increase their earning capacity by turning an avocation into a vocation. It was reported in The New York Times, that while other businesses are challenged, psychic related businesses are on the rise. Each course encompasses five semesters. These semesters are comprised of 10 lessons each. There will be fifty lessons in all. The course is a journey we will take together as a community, and much concerning the class will be decided by class consensus. There will be liberal vacations in the summer (2 months aprox), and at holiday times.